The start of the new year has given me a little time before the children go back to school and I go back to teaching. With “Big Daddy” having some time off work, I was able to begin my New Year’s project. First on my list is something that I had bought at the Knitting and stitching show at Alexandra’s Palace back in October last year. 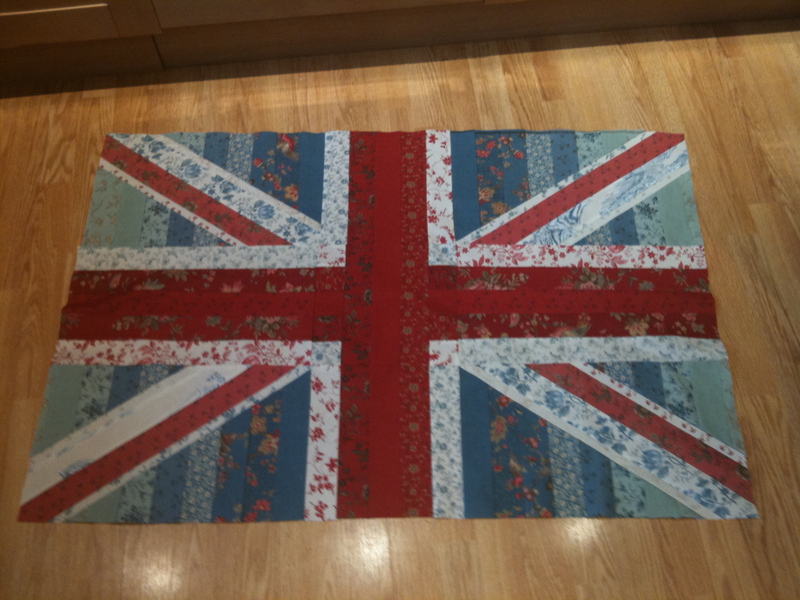 On one of the stalls was a lovely wall hanging of a Union Jack which had been designed by Liz Hands. The fabrics used were from the Moda collection Rural Jardin. I fell in love with the design and wanted to have a go a making it. 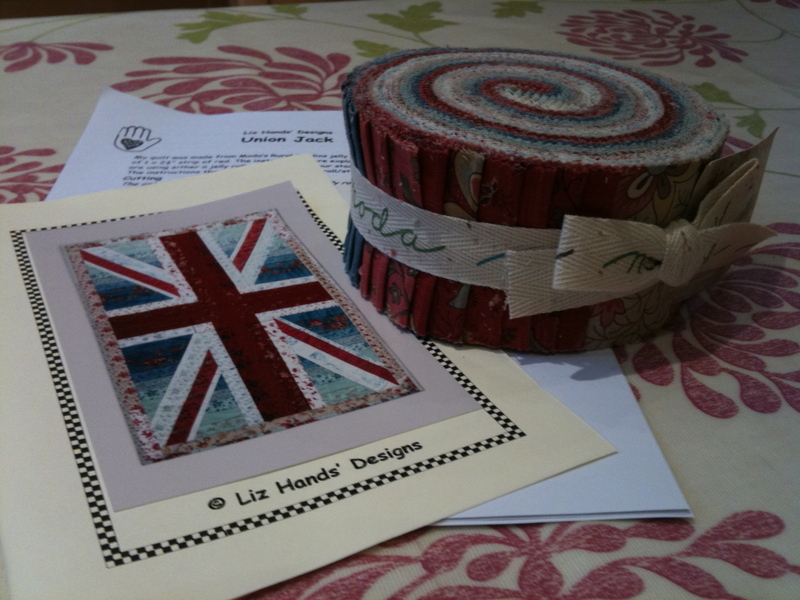 However, the fabric is no longer available in the UK but, I was able to obtain a jelly roll from the US. The instructions were a little hard to follow but I got there in the end, mostly by relying on the photograph rather than the instructions. 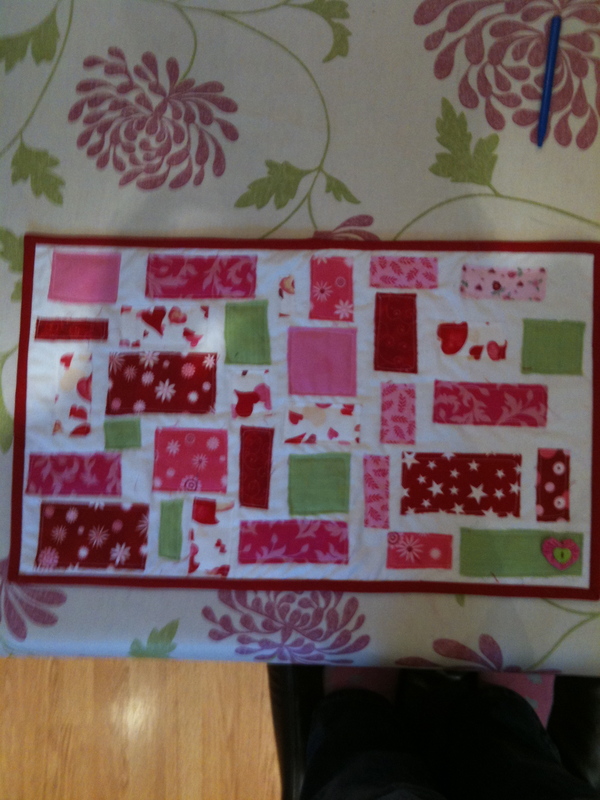 So the quilt top is now assembled and I found some matching fabric from my local patchwork shop. 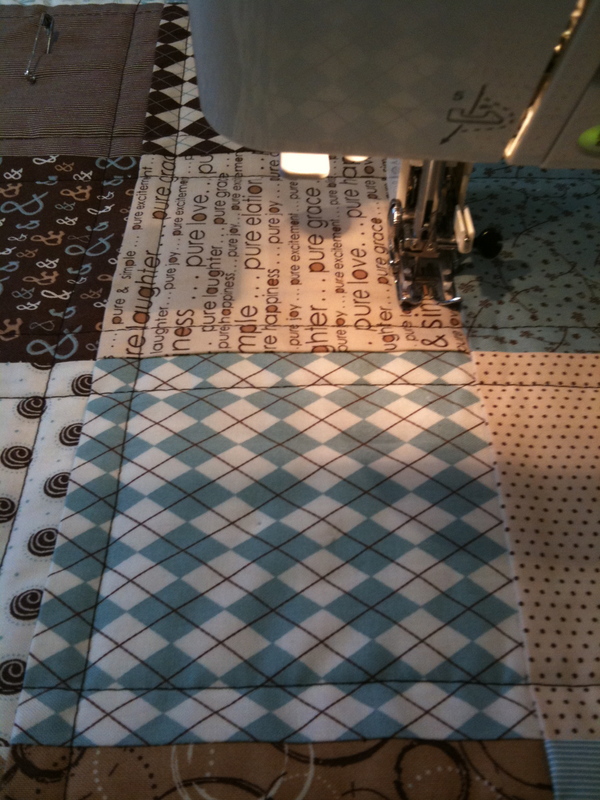 The quilt now has batting and is basted, so the next step is the quilting. I think that I will stitch in the ditch, but which ditches I will stitch in remains to be seen. Father Christmas was good to me on the sewing front this year. A new cutting mat, rotary cutter and several bundles of fabric were amongst my gifts. The last few weeks have flown by. 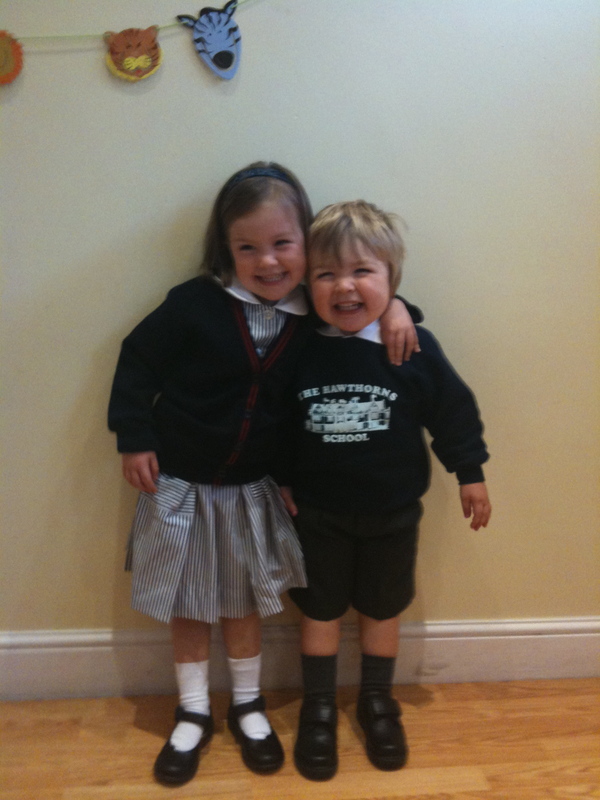 My first term back of work was hectic and the children started at school, so it was whole new start for us. Anyway, forgive me if I am repeating myself the arrival of the end of term meant that it was time to start making gifts for Christmas. First off, presents for the Teaching assistants. 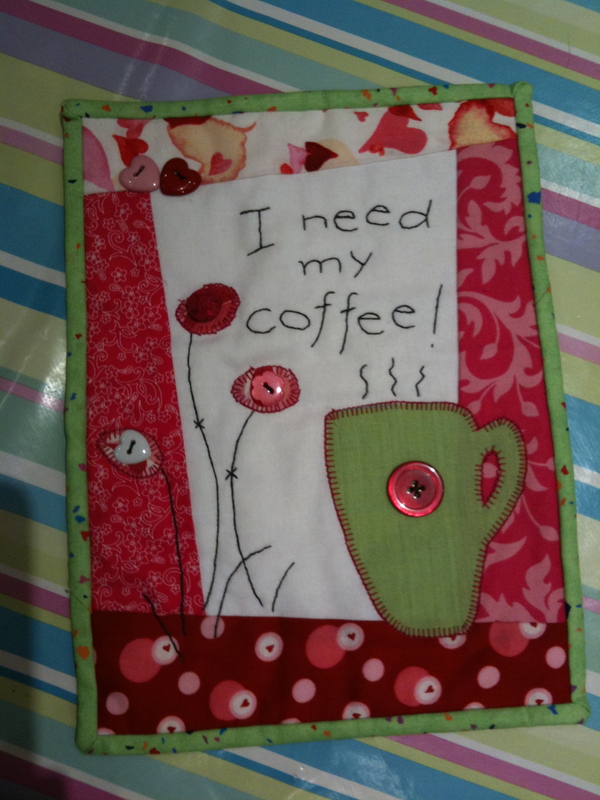 I decided on making some wall hangings out of scraps of fabric and batting that I had in my stash. The pattern was a “House on the Hill” design and only took a couple of hours to do. I did not have so much of a choice with the pieces of fabric for the second one, so I personally prefer the original. Next on the list were presents for the teachers. I had previously ordered two Moda charm packs (Hunky Dory and Pure). Being a bit pressed for time I made them into table runners both in different designs. Unfortunately, I forgot to take some photos of the second one! But here are the photos of the Moda Pure one that I made. 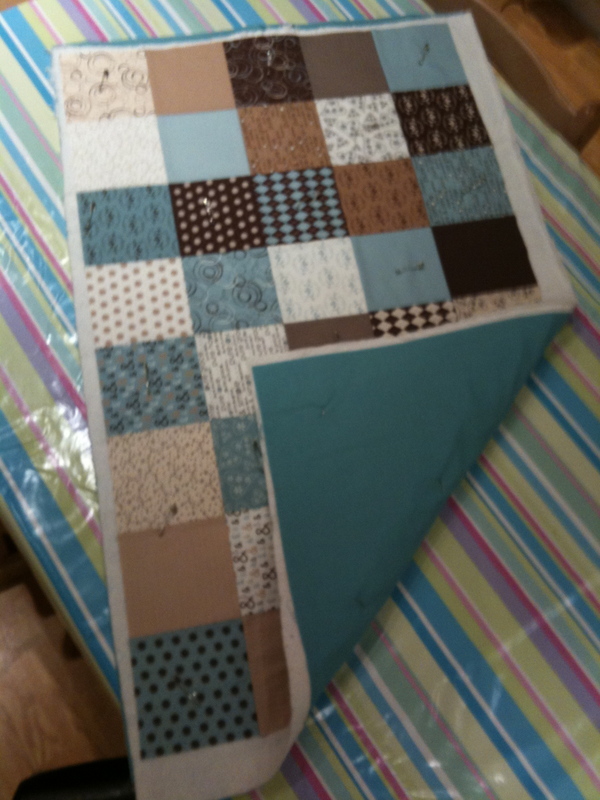 It was such a pleasure to quilt this, I just love the brown stitching on the pale squares and the teal backing. For sometime, I had been thinking that I should really make something for my Son (in the interests of fairness and treating them both the same). I toyed with several theme ideas; pirates, dinosaurs and “Hungry Caterpillar”. A trip to the Knitting and Stitching show at Alexandra Palace provided me with the inspiration and theme for my next work of art. 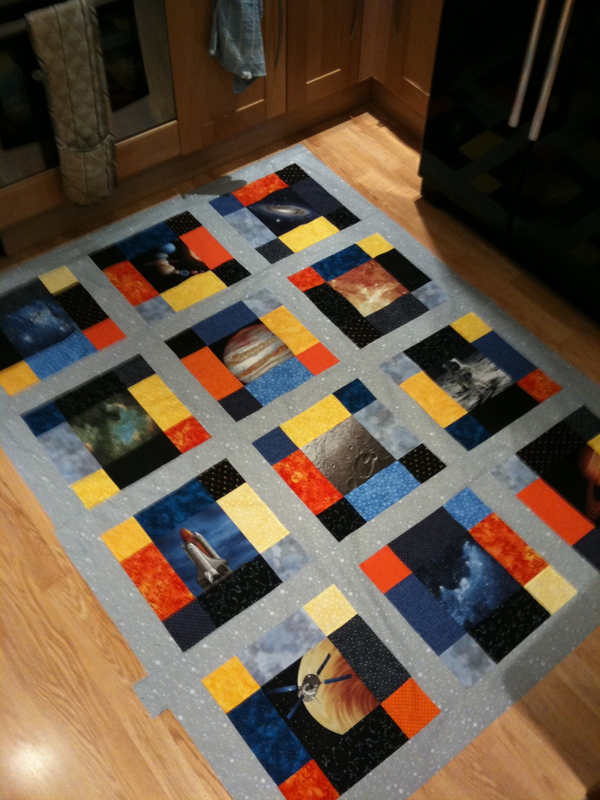 One of the exhibitors had some Benartex fabrics and amongst them was a panel with several space pictures. Eureka! What a great idea, it was perfect, not too babyish and would see him through many years. Once home, I selected several matching fabrics from the range and also bought several fat quarters of bright and colourful fabrics to contrast with the dark space ones. But, how should I set it out? The blocks/ pictures on the panel would only end up being 7″ square when sewn together and this was not big enough for the Boys’ cot-bed. So I set about searching for block ideas on the web. After a bit of searching I settled on a design and set about making a practice block. 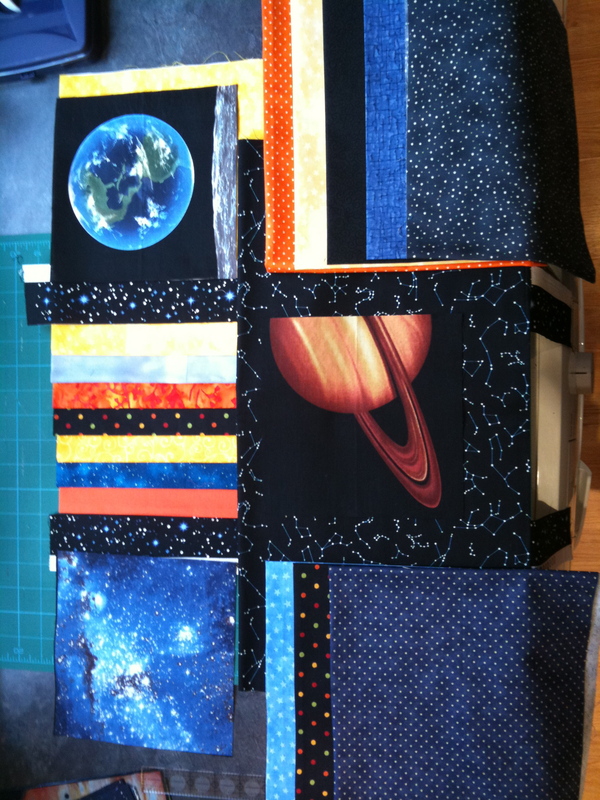 After spending ages cutting and pressing all the strips, I assembled the various blocks and then joined them together and then began to assemble the quilt top with sashing strips between the blocks. I must admit, I am fairly happy with the blocks and how they lined up. Now for the backing. 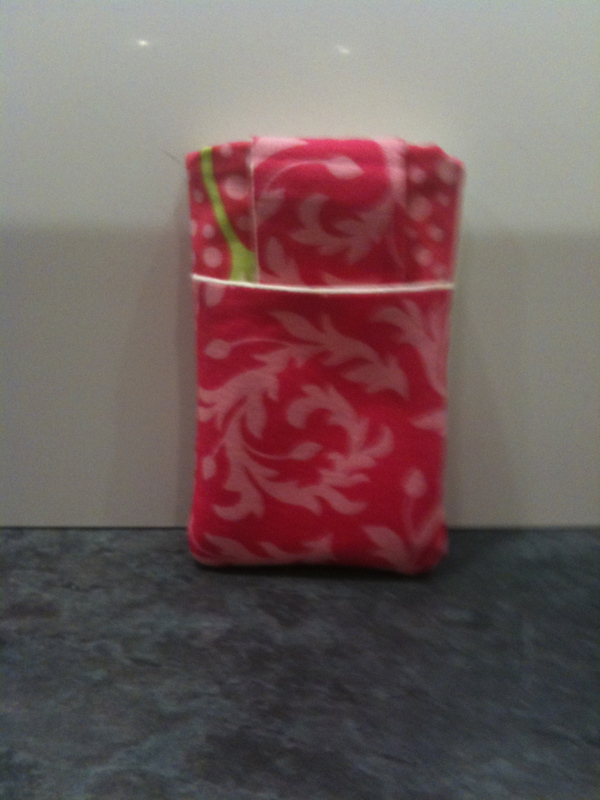 The quilt top measures 54″ by 70″ so one continuous piece of fabric would not cover the back. Hmmm, again I turned to the web for ideas. In the last few days I have spent a lot of time trawling the web and looking at quilting blogs, boy I am jealous of all the talent out there! I hope to be able to get to that standard some day. 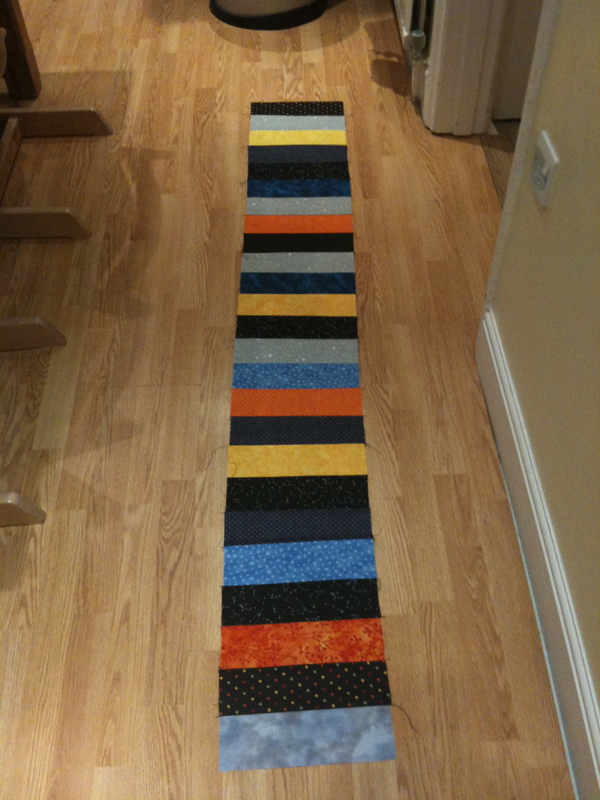 So, at last after doing a bit of browsing, I have decided to do a piece backing using a bordered strip of rectangles using the fabric that I had left over from the front and a large strip of co-ordinating fabric that I was able to cut lengthways in order to make up the rest. Lets hope that it sandwiches well with the batting and the quilt top, but thats a job for tomorrow. Wow, so much has happened since my last post and I really must make more of an effort to write a bit more. Since the success of my top, I made another one in an Amy butler fabric for my holiday. We went on a family holiday to Jamaica as my Little Monkey was going to be a Bridesmaid. It was a fantastic holiday and one of the highlights was the chance that I had to swim with the Dolphins! After our holiday, I did not have that much time for sewing; I was busy preparing for my return to teaching after having my two children. In addition to this, the Monkey and the Boy both started Pre-prep Nursery, so there were big changes in store for all of us. 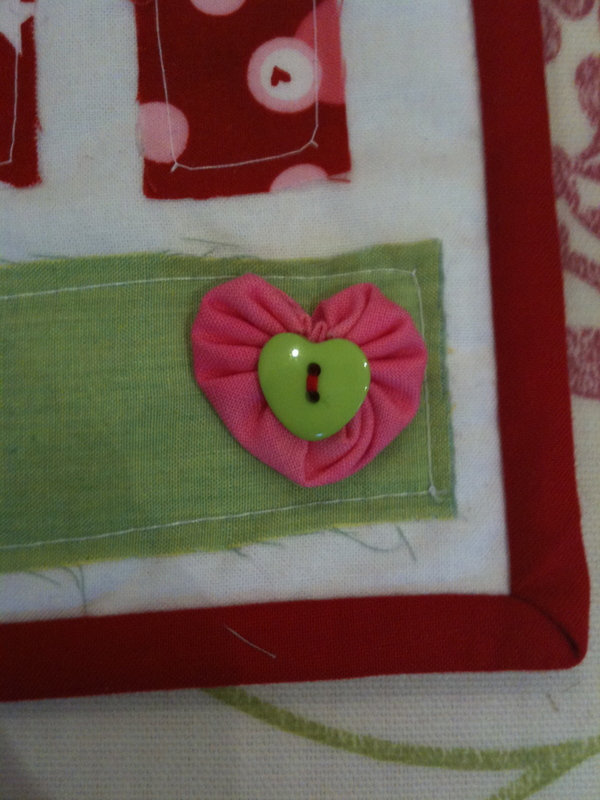 A few weeks after my return to work I began to get sewing again. I wanted to use us some left over strips from a part-used Jelly roll that I had bought earlier in the year to make a table runner for my Mother-in -law. 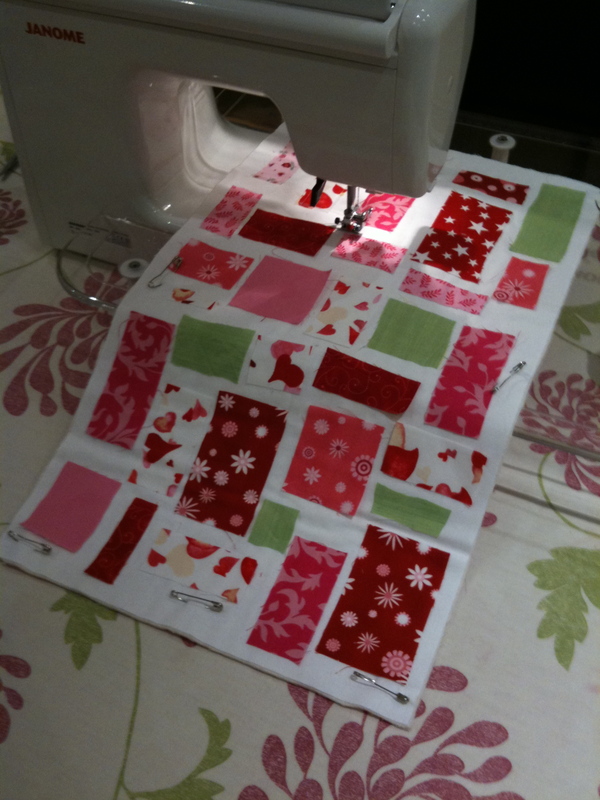 So I set about making a small lap quilt for myself. (The first real project just for me!) 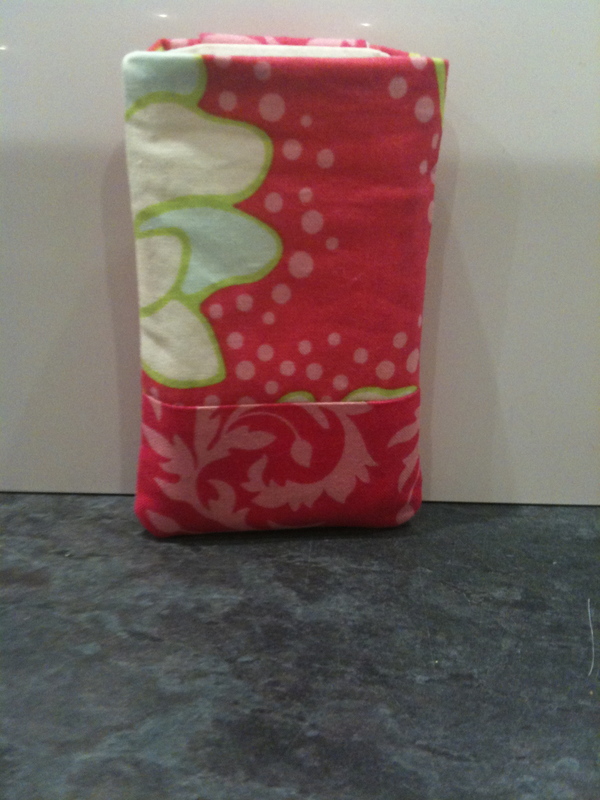 The fabric was from Moda and was from the Hunky Dory collection. 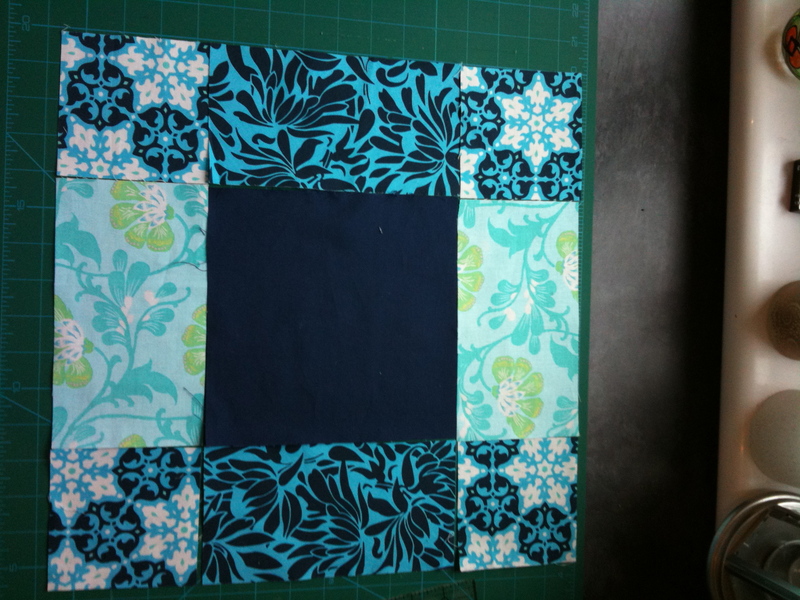 I decided that I wanted make a simple and quick quilt so settled on a simple strip/block design. It went together really well. 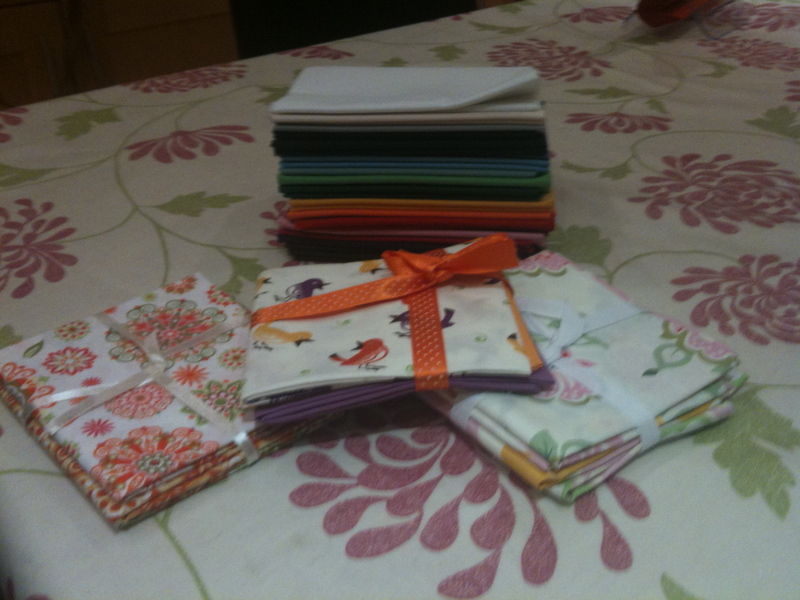 But, when I came to choose the fabric for the backing I just could not decide. In the end I went for a green fabric which had small yellow flowers on it and used a yellow fabric for the binding. 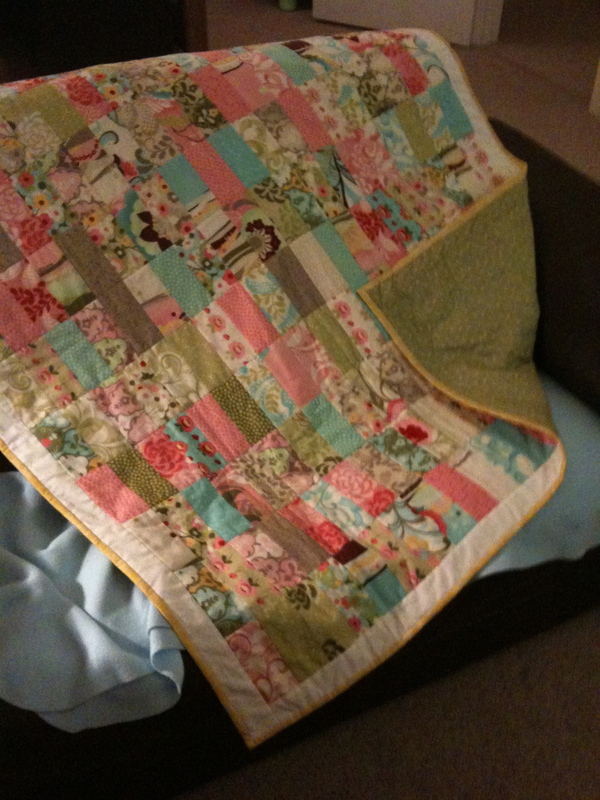 Originally, I wanted to pick out the pink or blue in the quilt but I could not find a fabric that matched well with the tones of the two colours, so in the end I went for a fabric and colour that I would not have normally chosen. I am really pleased with the final result. 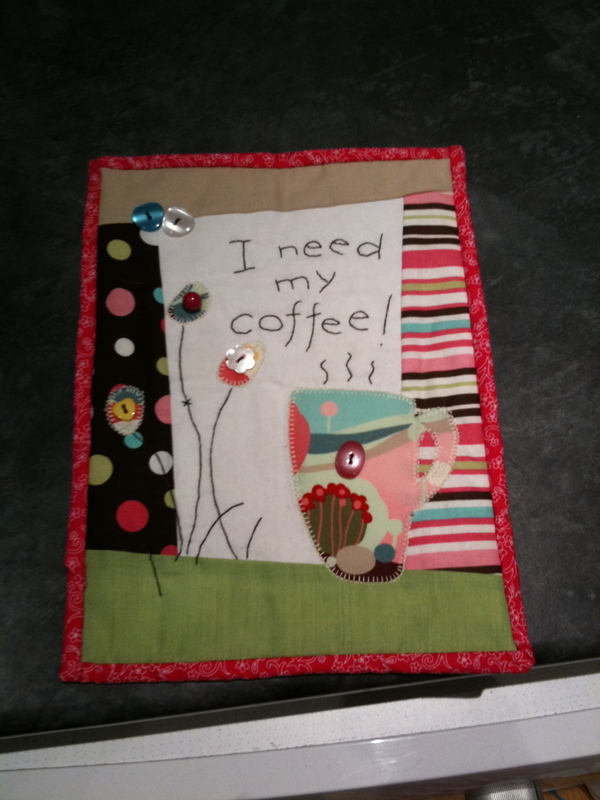 After this, I wanted to use up some scraps and my sister gave me a good idea by sending me the link for making some table mats which were made by simply sewing the scraps of fabric directly onto the quilt top. I had just enough white fabric and batting to make two mats. I made a red and pink one for my Mum for her birthday and I made a blue one for my Sister. Well it has been a while since I last posted here and things have moved along in my sewing world. The summer weather has encouraged me to make some clothes. A few weeks ago I bought some Amy Butler patterns so I could have a go at making some tops. 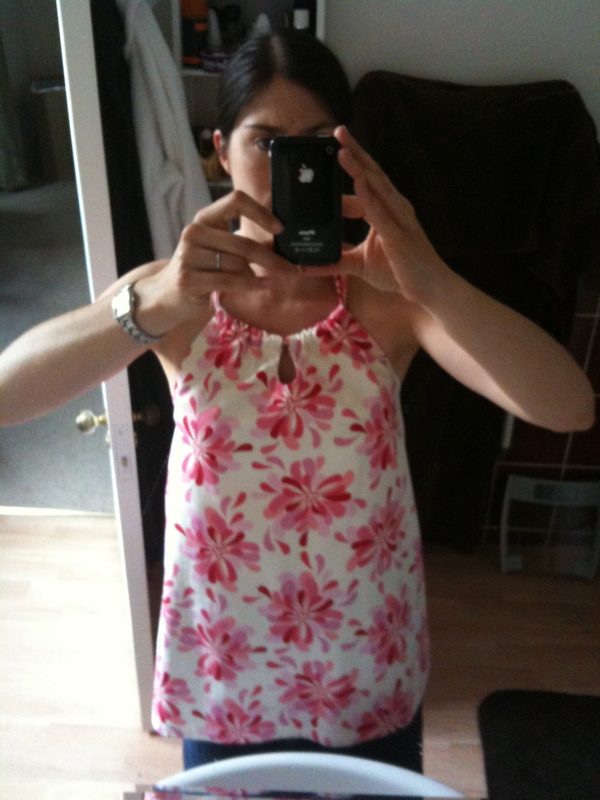 My first attempt has been Amy Butler’s Sun Surf Halter, which I have made using some Sandi Henderson fabric. 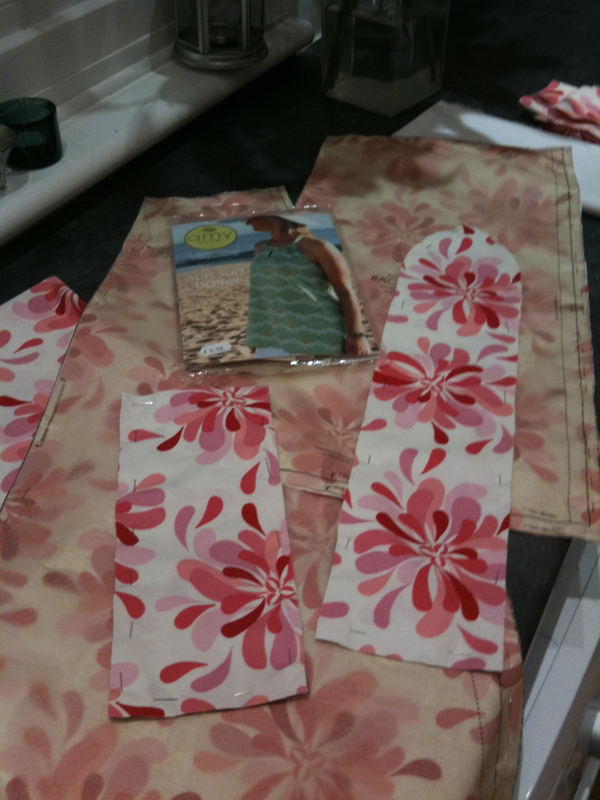 The pattern pieces of the Sun surf Halter. 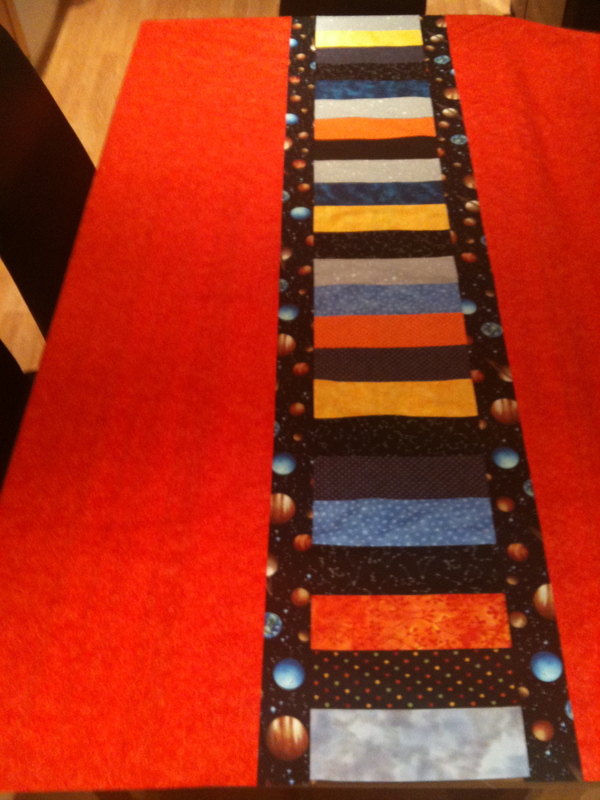 The pattern consists of a front, back, lining (just on the front) and a tie. Being a complete beginner to this clothes making activity, I found the detailed instructions fairly easy to follow (once I had got my head around the terminology such as right side, wrong side, top-stich etc). Anyway, I am pleased with the finished result. The only parts that I felt I needed more experience is the cutting of the keyhole opening on the front and folding over the edges to make the casing on the front panel. I felt that the folded over edges of the casing poked out a little bit from behind the front of the panel. I have enjoyed this so much I am going to make another in blue. These tops are going to be perfect for my holiday in a few weeks. We are going to Jamaica as my daughter is going to be a bridesmaid. Before I started to cut the fabric for the the next top, I had bought a few patterns to make another top and a simple skirt for my daughter. So my task yesterday afternoon was to have a go a making the skirt. 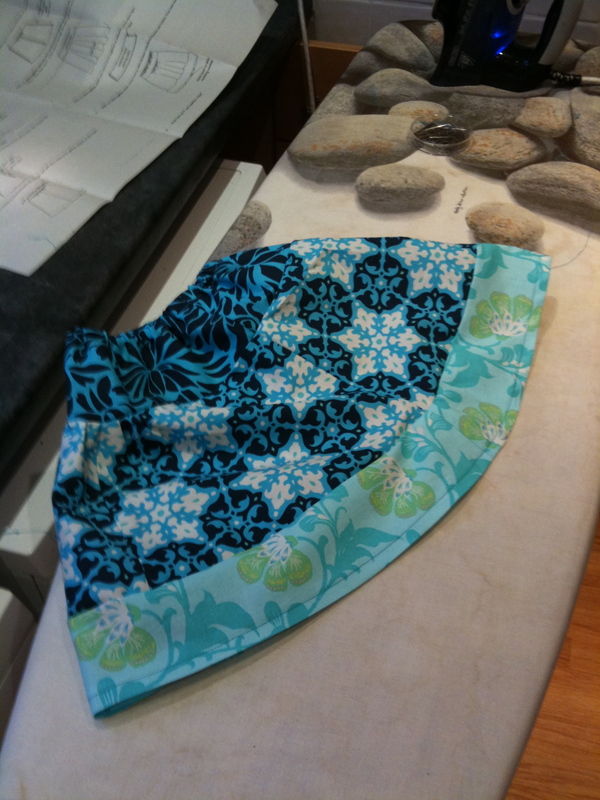 Using scraps that I had from other projects, I managed to make a skirt from a selection of Amy Butler fabrics. The pattern design, although simple was not as detailed as the halter neck top so I did find my lack of experience at little bit hindering. I had to unpick some bits a couple of times as the seams did not quite line up properly. Still, I am happy with the final skirt and will be making some more in the future as G gets bigger. 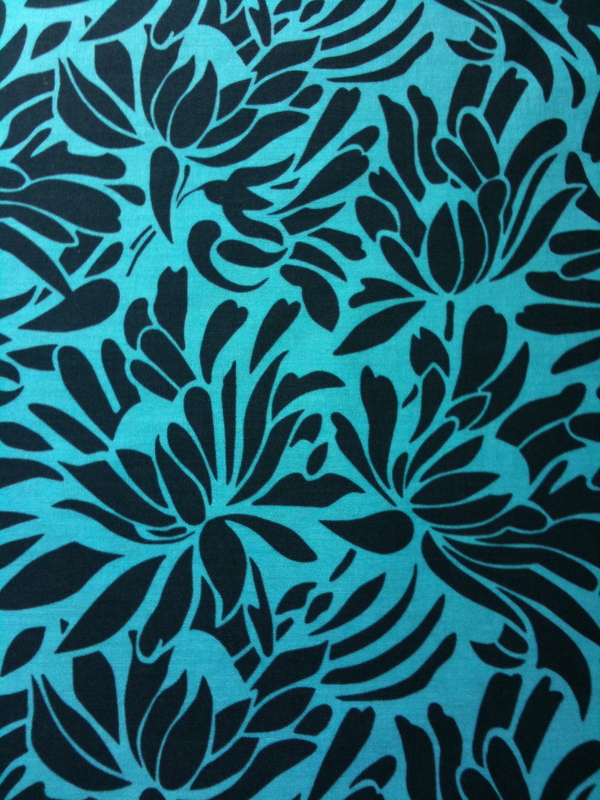 In terms future projects, I would like to make some sun-dresses, in particular some using shirring elastic. I was recently inspired after reading another sewer’s blog. Since my last post, I have been a little bit carried away with myself and have neglected to take photos of the projects that I have been completing. 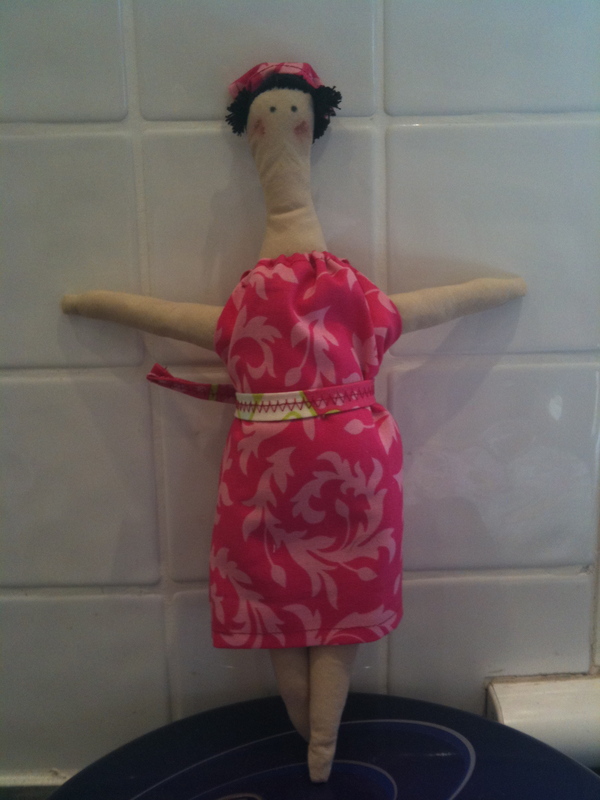 So, I have completed two projects; an iphone holder and a Tilda doll for my daughter. The pattern was one that my sister downloaded. She had tried another pattern but it was not very good. We liked the look of this one because it wasn’t just a simple sleeve, it also had a pocket for storing credit cards in. It was relatively easy to construct, made up of two different sides, each being lined with fusible interlining and then lined with a different fabric. It was mostly a case of measuring accurately and cutting neatly. Preparing one of the sides. This project took me a couple of hours to complete and I am pleased with the results, especially as I used my current favourite fabric. 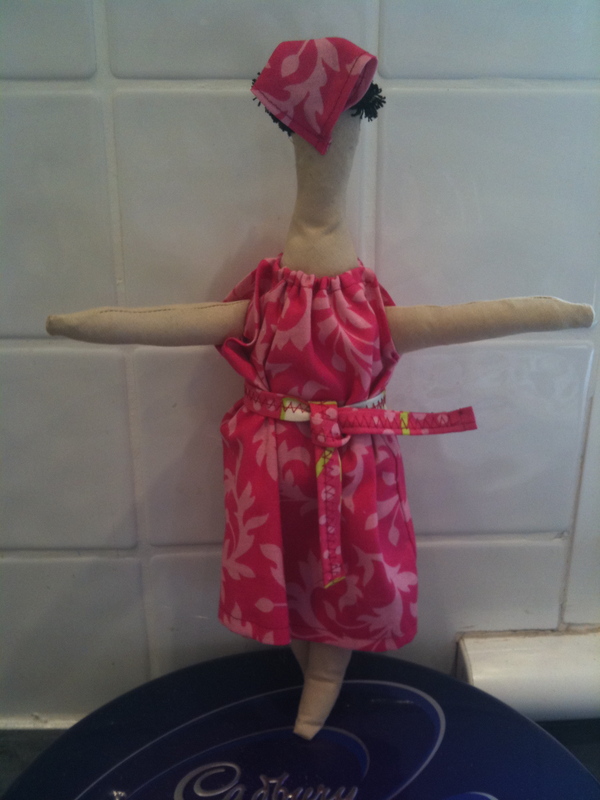 My second project this week has been a Tilda doll for Grace. I wanted something else simple to do before attempting my Amy Butler top and apron. 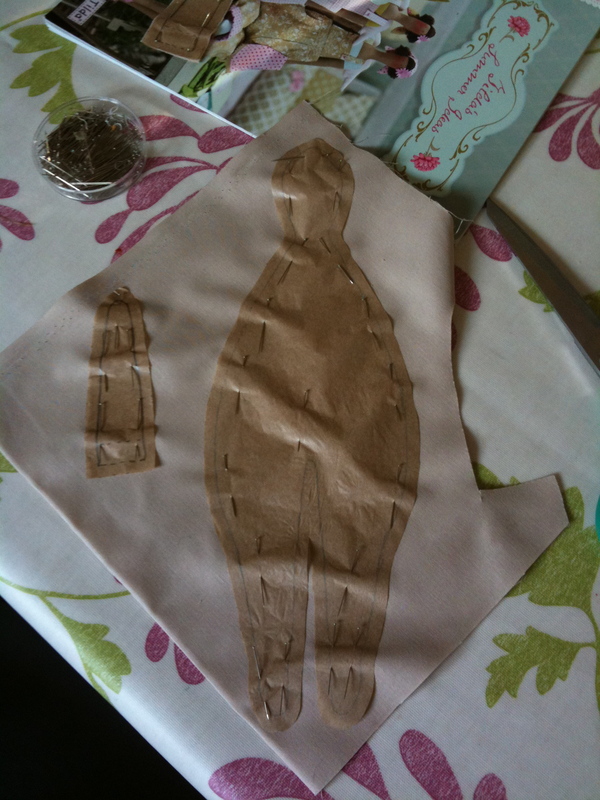 Using the pattern, I copied the outlines onto some grease-proof paper and then used these templates to cut out the fabric. 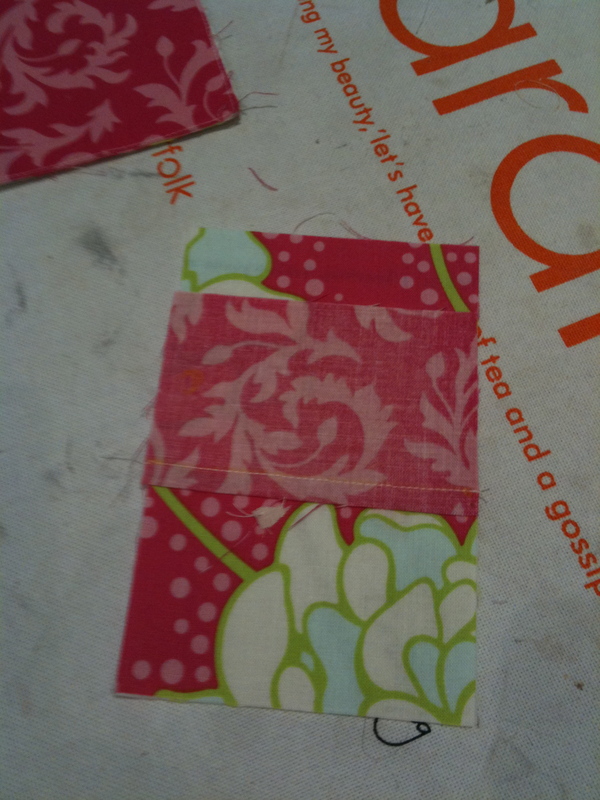 The templates pinned to the fabric. I then cut them out as carefully as I could. I must admit, this was only the second time I had cut out fabric like this and I found it fairly tricky as i wanted to be as accurate as possible. 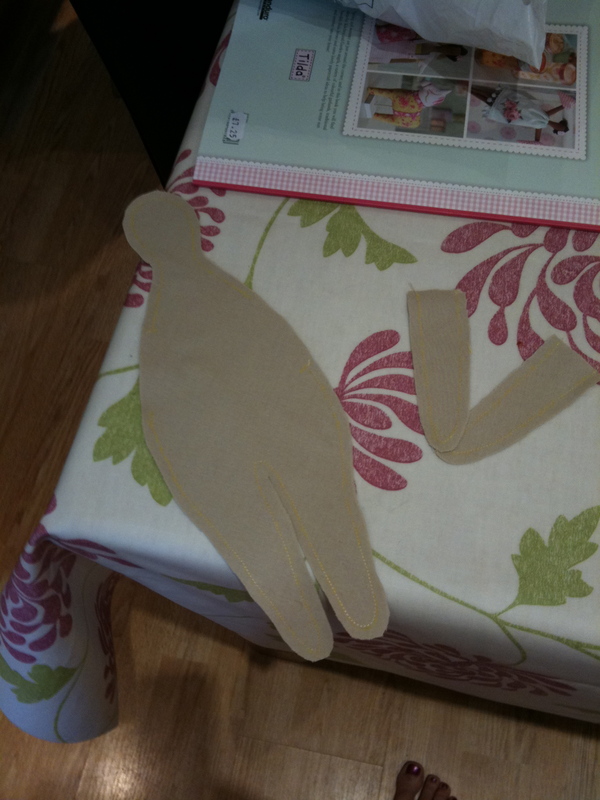 The pieces of fabric cut out ready for sewing. I then had to sew the two sides of the fabric together and this was not too difficult to do, although I had to do this free hand as the seam had to follow the shape of the doll. This done, the doll was turned inside out and stuffed. The arms were then sewn together and attached. 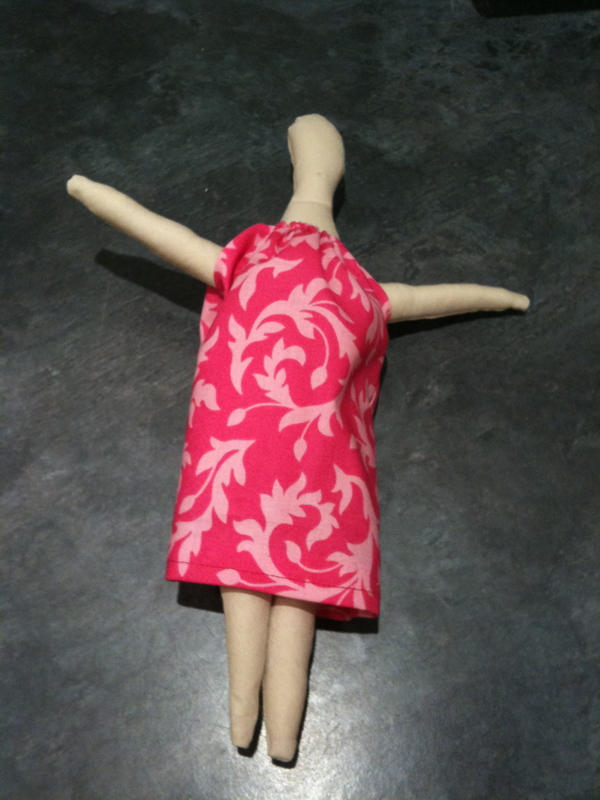 Following this, I then made a simple dress for the doll. To finish it off, I had to sew on some hair and I must say, I found this a pain to do, it took ages and I didn’t really like the look it ended up with. I completed the doll with a little hairpiece and a belt. Grace was pleased with it (even if I am not so pleased with the results). My son now wants one, so I think I shall make him one but with shorts and t-shirt, to make it look more like a boy. I may need to think carefully about how I complete the hair.